I’ve been having a wonderful weekend here with my friends. We’ve made a ridiculous amount of food, we’ve sat around the fire pit outside and talked until late in the evening. We’ve emptied bottles of wine and indulged in chocolate from all over the country. We’ve laughed and made terrible jokes. We’ve watched our favorite television shows on Netflix, and closed down the outdoor patio with our risque conversations and shared with each other about our lives and our hobbies. This mini-vacation is half over and I don’t want it to end. Right now, we’re all sitting on our laptops and phones, catching up on the outside world and sending our updates. Just now Margarita Gakis looked up and said, “Ah, the sound of my people.” She was referring to the clickedy-clack of fingers flying over keyboards. We all laughed, but she was right. We’ve traveled here from all over the world to gather here because of the love of a television show, but we’re also writers, and artists, and creators at heart. The show is simply the nidus for our creativity. 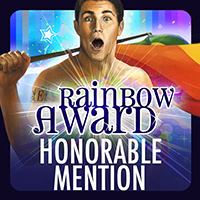 In other news, I found out this morning that The Boys of Summer received an Honorable Mention in the 2013 Rainbow Awards. I am grinning like an idiot here. I’m pretty sure that this is as far as the story will go in the voting, but it is exciting to see the quality of my company. No, seriously, I know people say things like “It’s such an honor” in situations like this, but go, look at the lists! These are amazing stories and it is truly delightful to see The Boys of Summer here. Look at the lovely artwork by Paul Richmond on these banners here too! This entry was posted in Uncategorized and tagged awards, life balance, The Boys of Summer, writing by Sarah Madison. Bookmark the permalink.